Some drizzle, heaviest währ. Dienstag morg.. Very mild (maximal 19°C am Montag nachm., min 6°C am Montag abend). Wind will be generally light. Heavy rain (gesamt 39.0mm), heaviest währ. Freitag nachm.. Very mild (maximal 19°C am Donnerstag nachm., min 2°C am Freitag abend). Wind will be generally light. Die Table oben zeigt die Wettervorhersage für Saalbach Hinterglemm auf der angebebene Höhe von 1003 m. Unsere ausgeklügelten Wettermodelle ermöglichen uns die Schnee-Vorhersage für die Gipfel-, Mittel- und Bodenstationen für Saalbach Hinterglemm. Das Fenster über der Tabelle ermöglicht das Abrufen der Wettervorhersage für andere Höhen. Für einen umfassenderen Blick auf das Wetter, siehe die Wetterkarte" von Austria. 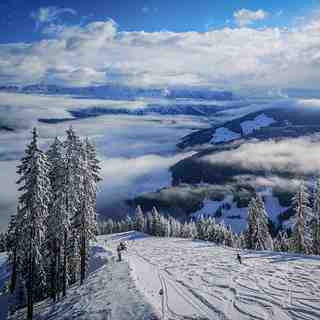 I have traveled to Saalbach for over 20 years, alone and with my family, and have been there at least 25 times. I have also skied in Italy, Bulgaria, Switzerland, Australia and Colorado. Saalbach remains my favorite by far! The things that keep me going back are the great hotels, very friendly locals, great skiing and exceptional apres-ski. Saalbach has become a second home to me and to my family. Every year a fortune is spent on upgrading lifts and infrastructure and the result is an amazing, modern system which is efficient and user friendly. 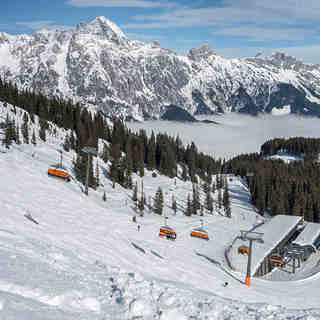 The main lift system is being replaced this coming summer at a cost of 30 million Euros. As such there are no queues and no irritations! There are over 60 huts in the mountains around Saalbach and a drink or great meal are never far away. Two years ago in zero snow they had fantastic skiing with the majority of the runs open and covered in beautifully prepared artificial snow! The rest of Europe was green but the Saalbach infrastructure stepped in and still managed to provide great skiing in Saalbach and connected areas! If you want an exceptional resort full of atmosphere then do not miss an opportunity to ski in Saalbach!